Missouri Synod on 2011 NIV: "inappropriate ... to be generally recommended to the laity of our church." Read more about Missouri Synod on 2011 NIV: "inappropriate ... to be generally recommended to the laity of our church." 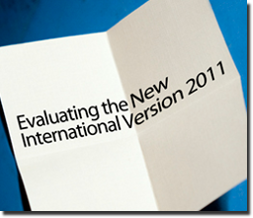 NIV 2011 has stronger wording agianst homosexuality? “The latest version of the popular NIV Bible translation has had its verses on homosexuality reworded, making them clearer in denouncing the practice” according to translation Committee Chair Douglas Moo. Read more about NIV 2011 has stronger wording agianst homosexuality? Notwithstanding the doctrinal imprecision and blatant politically-correct translating agenda, there are additional reasons why I dislike gender inclusive Bibles. Undoubtedly the publishers had good intentions, and genuinely wanted to help women, but in my mind, a gender-inclusive Bible is BAD for women. Really, really bad for women! Republished with permission from Baptist Bulletin Sept/Oct 2011. All rights reserved. New translations often face considerable opposition if they attempt to replace long-cherished traditional versions. The KJV was bitterly opposed in 1611 by many who clung to the Geneva Bible (witness the Mayflower pilgrims!) or the Bishop’s Bible. Revisions of existing translations sometimes experience the same fate. “Keep your hands off my Bible!” is a common perspective—and perhaps for good reason in some cases. At best, this attitude could reflect long years of memorization and meditation on words that have become so ingrained in readers’ minds and hearts that they seem second nature, in contrast to which different words and phrasing seem out of sorts. However, this attitude may also simply reflect an obstinate resistance to change. Change in itself is not necessarily good. But when change can result in greater accuracy and more ready comprehension of the Word of God, at that point, inflexibility serves not to protect fidelity to Scripture, but to hinder effective discipleship and ministry.